Dallas Fort Worth preferred Tree Pruning Company. Pruning is the most common tree practice done to urban trees. As a professional tree pruning and tree service company, our arborists can prune your trees in the Dallas Fort Worth Metro for the best possible appearance while allowing your trees to meet certain requirements, improve tree health and also exceed your expectations. It is very important to know the tree service company hired to prune your trees because trees are assets to properties adding value, keeping properties shaded cool during summer and hiring a tree service company in the Dallas Fort Worth with little knowledge on tree pruning may result in permanent damages and unpleasant looks to your trees. Chippers Tree Service employees have the proper training and understand how to prune trees without removing excessive unnecessary live foliage. We are the professional tree trimmers for all of Dallas- Ft. Worth TX. Chippers Tree Service also services Collin and Denton counties. See the list of cities we at the bottom of page.We recommend a tree inspection every two years for new developed deadwood and new growth as a precaution. Trees are less prone to failure if kept maintained; therefore, trees that are not maintained over time get heavy at the end of limbs and have a greater chance of breaking if too much weight is accumulated. Large tree branches that break will cause a permanent damage to the tree that it will never grow the same back. 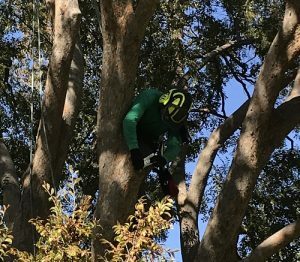 Our pruning services consist of deadwood removal, thinning “sucker growth”, limb breakage removal, removal of rubbing limbs if small enough, removal of diseased limbs and balance of tree canopy. Your trees will be much healthier and happy for having our pruning services done to them. Chippers Tree Service cares about the trees in the Dallas, Fort Worth and surrounding areas. Our employees do not use climbing spikes to your climb trees. Climbing spikes will damage the trees by poking wounds throughout the trunk and branches causing several open wounds that the tree will need to close. We also do not remove any big size limbs without a reason. Removing unnecessary big tree limbs will only stress a tree more because every cut made is a wound that the tree will need to close. Trees have to provide extra energy to close these wounds and if too many limbs are taken off and if the trees do not have enough energy, the tree will stress and slowly decline. A stressed tree is more susceptible to attract insects and wood rooting organisms oppose to a tree that is healthy and less stressed. For a FREE estimate, give us a call at (972) 743-9959 or fill out the online contact form and you will be contacted within 24 hours. Thanks for visiting our website! We look forward to servicing your tree needs.